While I know that a shadow puppet theater has only a few things in common with a marionette theater, I have been asked to create on for a friend's event. One of the themes for the event is Japanese, and she wanted to be able to have people tell stories using this time-honored oriental tradition. As with all my projects, I try to complete the research first. I find that understanding the traditions, stories, and methods surrounding a project make doing something like this more entertaining and educational instead of going out to buy the lumber first. 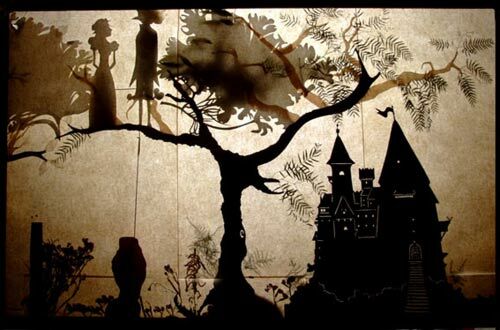 An example of an elaborate shadow puppet scene. According to popular legend, the history of the shadow puppet originated in China during the Han Dynasty. The Emperor had lost his favorite concubine to illness and lost his desire to rule. A minister, often times referred to as a priest in some stories, was inspired by watching the shadows of dolls that children were playing with. Armed with this amazing idea, the minister created a cotton puppet and painted it to look like the Emperor's favorite concubine. From there, he performed behind a back-lit curtain regaling the Emperor with tales of his love for his favorite concubine. Eventually the art form flourished. It is important to note that shadow puppets are not unique to China. 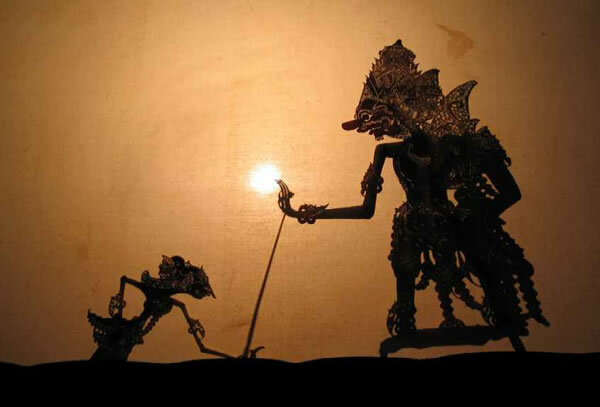 In fact, the Island of Bali has an extensive cultural history of a unique style of shadow puppets often times used to tell stories of gods and goddesses as well as important historical stories. The main difference between Balinese shadow puppets and the Chinese style of shadow puppets is the depiction of characters. These puppets are unique to Bali and can be easily identified due to their style. A style known as Wayang Kulit; a style mostly used in conjunction with cultural events. While I have no intention of creating a Balinese style theater yet, it is good to show that there are different styles of shadow puppets from our history. Shadow puppets, it would appear, are culturally unique even if the implementation is not. It is important to note that this project is focusing on the actual stage. There is currently no intention of creating the puppets themselves. While this may become an additional project later on, the person requesting the shadow puppet theater has made no mention of creating the props and puppets that would be used in such a production. I found several good resources on the Internet regarding shadow puppet theaters. The design itself is relatively simple, and as such, the majority of the resources found are how to create a theater for children. These resources are still valid considering that the construction and basic parts of the shadow puppet theater are the same no matter what the material or venue; they just require some creative thinking. A simple shadow puppet theater consists of three items; a proscenium, a light source, and the actual puppets. The proscenium, similar to that of of our marionette theater, has the opening covered by a cloth that allows light through. The light source in our project will be a lamp of some sort that can be positioned to throw light onto the back of the screen. As mentioned previously, the marionettes are not going to be worked on in this part of the project. The first part of the plan is to understand where the shadow puppet theater will be placed. If it is a "table top" version, our measurements will be drastically different from a free-standing version. From there, it is a simple matter of developing measurements and getting the materials. The next part of the project is actual construction. A simple free-standing proscenium (no matter what the height) will be one large panel in which the puppets are viewed from and two smaller panels that act as the wings; identical to the front proscenium we created for the marionette theater and discussed in our A Portable Stage post. Decoration in an oriental style would be desired to help solidify that this stage has a specific purpose and add a unique flavor to the whole project. Additionally, the wood should be stained or painted as to help lend to the medieval atmosphere of the event. The last part of this project will be to attach fabric to the proscenium. Ideally, the use of silk would be used, but the cost of silk is prohibitive to our group. Linen is the next best choice, and finding a thin linen would be ideal in this endeavor. Below is a list of links that I found useful. They range anywhere from the history of shadow puppets to the construction of children's stages. Excellent article that discusses the history of the art form and provides examples of styles unique to the region. A visual of a possible front of a proscenium. Collected only for the visual idea. Just a simple resource on the basic construction of the theater.